"Sadly, I have been told very recently that I need a heart bypass operation. Whilst it’s not desperate it is obviously something which I need to get done as soon as possible. All being well, the operation will take place in August and there will then follow a three month recovery period after which I anticipate being able to return to work as normal. Unfortunately this affects a number of shows which unavoidably must be postponed until at least early Spring next year. My sincere apologies to all the theatre-goers who have bought tickets to my shows but I know you will understand that my health comes before anything and I will do my level best to get back in action as soon as possible. Thank you for your understanding and again my apologies for the disruption and inconvenience to everyone concerned. 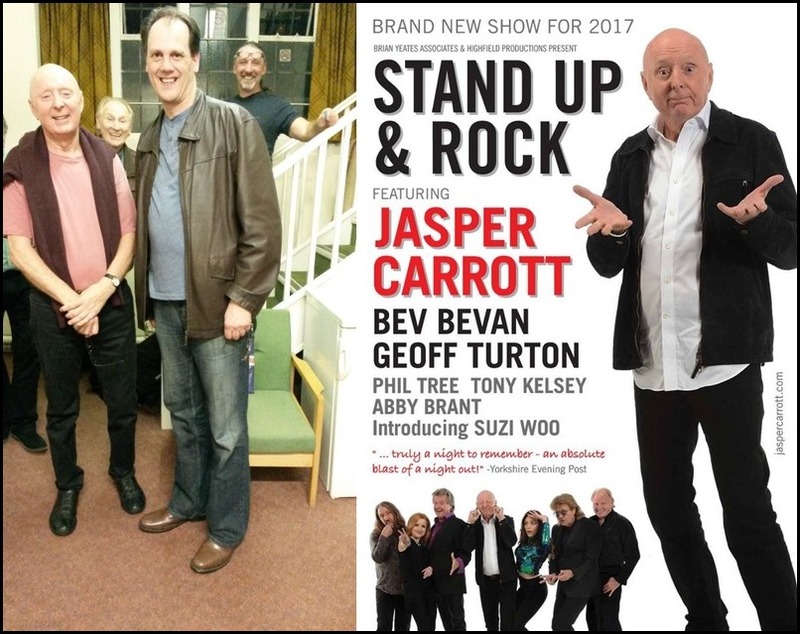 Kindest regards ... Jasper Carrott"
The postponement applies to all previously announced dates in July and September until the tour recommences in Shanklin, Isle of Wight on Wednesday 7th March 2018. It goes without saying that Yours Truly KJS wishes Jasper Carrott a speedy recovery from his procedure and looks forward seeing him on stage again in 2018.
elobeatlesforever (elobf) recommends Stand Up & Rock! to those enlightened folks who enjoy the music of ELO, Jeff Lynne, The Move, Roy Wood, The Idle Race, 'Brum Beat', The Beatles and related artistes. Hope all goes well Mr.Davis. Don't worry when your ribs rattle. when cleaning your teeth! Best, Rob Barnes. Ex Boggery , now retired to Espana. Best wishes Jasper, we saw u a few years back in Brum.